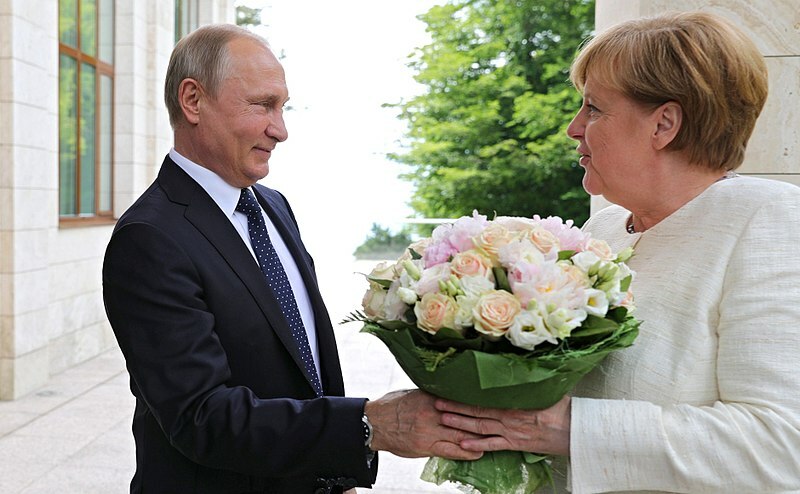 German Chancellor Angela Merkel met with Russian President Vladimir Putin at his residency in the southern resort town of Sochi to discuss, among other things, a possible common response to The White House and the agenda of American President Donald Trump. The leader of the United States has been pressuring Germany to spend more money on its own defense, incorporate more fair trade practices for American products, and has pulled out of the Iran nuclear ‘deal’ which has threatened German business interests. For its part, Germany is keen to push through the new gas pipeline from Russia called Nord Stream II. Other members of the NATO alliance, especially the Baltic nations, are very concerned this sends the wrong message to Moscow and could increase European reliance on Russian energy. Germany, which still spends much less than the NATO 2% of GDP target on its own defense, does not seem to be worried about the national security consequences of Nord Stream II, or the Iranian push to acquire nuclear weapons. Putin commented on the pipeline situation for reporters at the meeting. 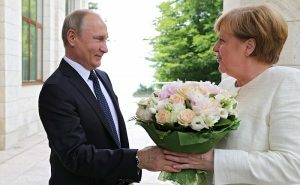 “Donald is not just the U.S. president, he’s also a good, tough entrepreneur,” Putin said at a news conference, alongside Merkel, after the two leaders had talks in the Russian Black Sea resort of Sochi. “He’s promoting the interests of his business, to ensure the sales of liquefied natural gas on the European market. “I understand the U.S. president. He’s defending the interests of his business, he wants to push his product on the European market. But it depends on us, how we build our relations with our partners, it will depend on our partners in Europe. “We believe it (the pipeline) is beneficial for us, we will fight for it,” reported The Moscow Times. Putin sought to drive a wedge between the two leaders of NATO over the energy, and Iran deals. The Russian president has been successful pulling Turkey, with one of the largest armies in the world, towards the Moscow sphere of influence. Turkey is now scheduled to buy Russian air defense systems and is openly defying Washington. The Russians relish this development. Putin would like nothing else than to develop a Russian-German wedge against The White House in Europe. Merkel responded, “Germany, Britain, France, and all our partners in the European Union continue to support this deal and remain in this deal and we know that a very specific situation arose that we Europeans need to discuss with Iran. Merkel said the EU is “currently discussing” a law that would block US sanctions on European companies wanting to invest in Iran, reported DW. They are also concerned that Washington’s reintroduction of sanctions on Iran threatens their economic interests in the country, added DW. “But this does not challenge the intensity of the transatlantic relationship,” Merkel added, wrote The Moscow Times.